The ‘Wine Genius Apps’ are coming? Even though the team at Wine Genius will always continue to improve www.winegenius.com, keep Australia’s most up-to-date wine map current, write interesting articles and blogs, and taste (and review) as much wine as we possibly can. We are also in the process of building three completely unique and exciting mobile Apps. ‘My Wine Genius App’- A mobile enhanced version of Wine Genius’ bespoke wine recommender will be available for you to take anywhere, ensuring that you will always enjoy the wine you drink. 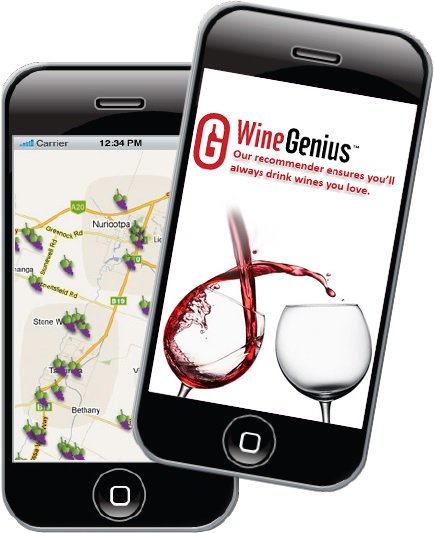 ‘Wine Genius Map’ – Carry Australasia’s best and most complete wine map with you everywhere. Plan your trips, and book your cellar door tastings all through your ease of your phone. ‘Wine Genius Tasting Book’ – All of Wine Genius 30,000 plus tasting notes, articles and blogs always at your fingertips. Judy Saris. Editor, Gourmet Traveller WINE.